Poached Eggs with Roasted Tomatoes and Hollandaise / Hey, EEP! I spent the past few weeks rekindling my relationship with savory meals. One thing DF and I do not share is my love of sweets (especially in the morning.) So I've ventured back into the world of creamy eggs & breakfast meats and surprised my roommate with poached eggs with roasted tomatoes and hollandaise one Sunday morning. 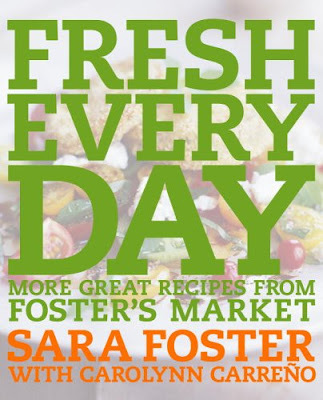 Fresh Every Day is one of my favorite cookbooks - a must read for anyone who's interested in seasonal, wholesome foods. Sarah Foster is one of the most respected authorities on fresh, local eating in the entire industry. Her cooking is simple, honest and full flavored; beyond delicious from bite to bite! And did you know that she worked with Martha?? Sara was a chef for Martha's catering business back in the early 80's and has contributed to many of her cookbooks. Two brilliant ladies. Unstoppable! Besides opening two Foster's Market locations in North Carolina, Sara has brought her fresh ideas on eating to home cooks with her collection of books (three to be exact.) I find I use Fresh Every Day more than any other cookbook because of the seasonal ingredients, short ingredient lists (makes a difference when you're cooking for one!) and priceless tips on substitutions, pairings, and leftovers. There has yet to be a recipe that I've disliked. 1. Prepare the Tomatoes: Preheat the oven to 400 degrees. Spread tomatoes on a parchment lined baking sheet and drizzle with olive oil. Toss to coat. Season with thyme, and salt and pepper to taste. Roast until tomatoes are soft and slightly charred, about 30 minutes. 2. Make the Eggs: Add the salt and vinegar to a saucepan of water and bring to a boil, then reduce heat to a gentle simmer. Meanwhile, crack eggs into small bowls. Stir the seasoned water in a counterclockwise circle with a wooden spoon to create a whirlpool. Slide one egg into the center of the whirlpool, folding the whites over the yolk if needed. Poach until the whites are opaque and the egg set, 1 to 2 minutes. Transfer egg to a paper-towel-lined plate using a slotted spoon. Repeat with remaining eggs. 3. Make the Hollandaise: Place the egg yolk, salt and cayenne pepper in a blender; blend until smooth. With the motor running, slowly pour the melted butter and lemon juice into the yolk through the feed-tube, alternating between the two. Season with pepper to taste. Serve immediately or store in the refrigerator for up to 2 hours. looks DELICIOUS! I'd join you for breakfast any day. One thing that should be noted is that before DF and before his hatred of sweets I was there loving your eggs. You actually tried this dish out on me first, and it was delightful - let that be known, readers of food and femininity - I, both foodie and feminine as well, loved this dish. Yum.